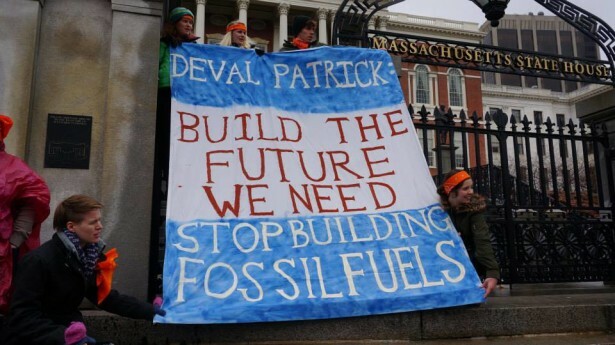 Youth climate activists are asking Massachusetts Governor Deval Patrick to ban all new fossil fuel infrastructure — an idea they believe has the power to shift mainstream thinking. While ostensibly a radical request, these young activists noted their demand is commensurate with the conclusions of the world’s most respected energy authority, the International Energy Agency. In its 2011 World Energy Outlook report, the IEA — known for its conservative findings — warned that nations must reject new carbon-fueled electricity plants by 2017 or risk “locking in” catastrophic levels of warming. Since fossil-fueled infrastructure requires decades to repay its large capital costs, power stations built in 2016 will continue to emit unsustainable levels of carbon until at least 2046. The IEA contends that the accumulated effects of these infrastructure projects amount to the most significant driver of climate change. Coordinating their efforts through the growing climate justice network, Students for a Just and Stable Future, or SJSF, have been organizing since last November to garner Patrick’s attention. Many of the young activists believe he is in an unparalleled position to take decisive action on mitigating climate change. With the authority vested in him by the state’s Global Warming Solutions Act — considered by many to be the nation’s most comprehensive climate legislation — activists assert that the governor can become a global climate champion. Signed into law by Patrick in 2008, the Global Warming Solutions Act mandates a 20 percent reduction (compared to 1990 levels) in carbon emissions by 2020 and a full 80 percent reduction by 2050. The law gives the governor the authority to enact regulatory emissions standards for power plants and supercharge renewable energy and efficiency investments — effectively banning future fossil fuel infrastructure. Unlike easily overturned executive orders, these new regulations would endure beyond Patrick’s tenure. The commonwealth’s own Clean Energy and Climate panel found that in order to meet mid-century reduction goals, the electricity grid must be powered by 100 percent renewable energy sources. If new natural gas plants are approved in the next few years, they risk violating this law, or stranding millions in capital investments to shutter the plants before their natural demise. For many, like SJSF organizer and Harvard history major Alli Welton, Patrick represents the last best hope for timely climate action. Drawing a firm line against new fossil fuel infrastructure not only aligns with the IEA’s conclusions and Massachusetts law, it also — according to Welton — represents a “viral” idea that has the power to shift mainstream thinking. Since the narratives surrounding carbon taxes and cap-and-trade policies have been compromised by the fossil fuel industry, a new solution is required. Similar to the logic of the divestment movement, which is the mainstay of SJSF’s campus activism, banning new carbon-based infrastructure would deal a blow to the political capital and social license of the fossil fuel industry. Since solar and wind power are on the cusp of undercutting the price of fossil fuel, a ban enacted by the governor could help turn the tide against fossil fuels once and for all. Over the past few years climate justice activists across New England have been doing just that, promising to “rise faster than the seas.” Last summer, massive protests and civil disobedience actions worked in combination with rising coal prices to ensure the closure of the state’s largest coal plant by 2017. Then, last month, over 400 rallied for Gov. Patrick to block a proposed natural gas plant in Salem that will almost certainly process fracked gas. As the largest generation in American history and those most affected by an unstable climate, millennials constitute a growing force in these demonstrations. And perhaps that shouldn’t be surprising, since those born after April 1985 have never lived through a month when the global average surface temperature was colder than average. Despite the sense that they have an ally in the Statehouse, these young climate activists are not planning to sacrifice their agency to the blind hope that the governor will make the right choice — let alone follow through on it. Many believe they made this very mistake with President Obama after his first election. With a network of thousands of millennials growing every day, organizers are in the midst of developing escalation strategies in case Patrick fails to take the necessary action. Ultimately, though, millennials like Welton fiercely want a climate visionary to rally behind. The fossil fuel industry would like to poison the narrative around a carbon tax, but they don’t even have to, because a lot of climate change organizers in Massachusetts are not even willing to make a carbon tax a part of the dialogue, even though it’s the one policy solution proven to be able to make the goal of reducing fossil fuel usage by 20% by 2020. I know some have heard me say this many times before, but i repeat it because it’s a very important message. We already have 3 of the 5 gubernatorial candidates committed to at least exploring a carbon tax for the state, yet 350MA and some other organizers refuse to make it a part of demands, and probably will not bring it up substantially in the meeting with Deval Patrick. I am curious to know what was meant by the statement in the story. When a narrative is in danger of being co-opted or poisoned by an industry, then we could decide to take up the challenge and make it right, and let truth be known. That is what happens with the fight for GMO labeling. Everywhere it’s put to a ballot, the agribusiness industry tries to poison the narrative, and sometimes succeed (just barely, in California, with $35 million of propaganda in TV and radio ads, and the like. Yet people there did *not* give up on the narrative, but pushed it forward. Now we have one passed in Connecticut and one possible in Massachusetts fairly soon. Why can’t we do this in regard to a carbon tax? Why do some climate change activists abandon the carbon tax policy, which would work and would effectively cause drawdown on new fossil fuel plants, and would encourage solar and wind and conservation? Under “proposed solutions” of the White Paper, SJSF and the Better Future Project want not only to “Ban the worst,” and “Build only the Best,” but to “Begin to Price the Rest”– ie, a carbon tax. Now activists may be incorrect in focusing on another argument (Ban the worst) rather than doubling down on a carbon tax. It’s really an issue of emphasis, as all three are crucial. Yet I think there is significant power in their argument to ban the nastiest forms of fossil fuels in MA. We seeing a similar strategy right now in calls to ban drilling in the Arctic. Stopping the dirtiest fuels and most dangerous extraction methods may well have a domino effect and tip the balance, for good, in favor of clean energy.